I’m in love with a dessert. This dessert. I know, it shouldn’t happen, especially to a gal who doesn’t try her desserts, but…well, I can’t help loving this recipe. For starters, it has coffee. In multiple forms. In my book, coffee=awesome. A dessert recipe with coffee? Double awesome. Then there’s the matter of how absolutely quick these are to make. The first time I made these, I stuck them in the oven and looked at the clock in amazement. The entire thing had taken just minutes from start to finish! I mentally swore off every other kind of cookie besides for bars, then, because I am crazy that way, I set out to make super complicated cookies. Because making such an easy recipe was like, a bonus hour or something. 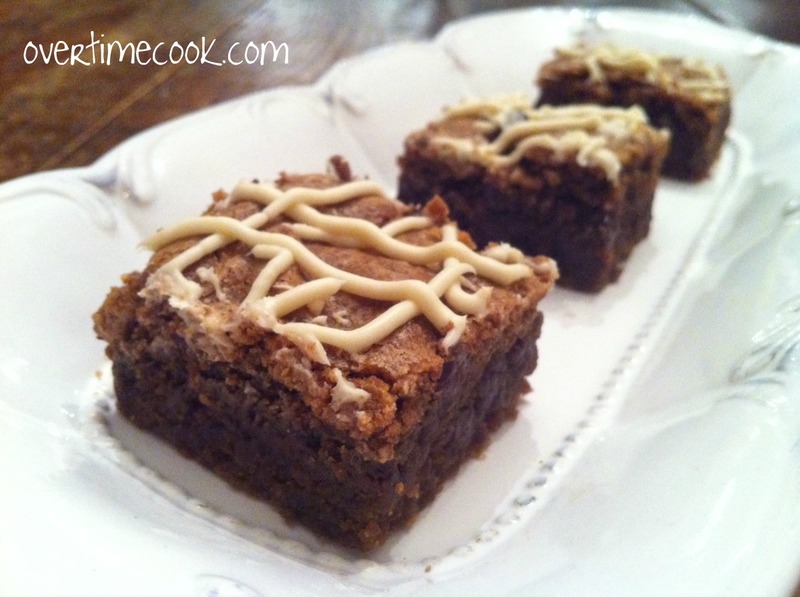 Call them brownies, call them cookie bars, I just call them awesome. Preheat oven to 375. Line a 9×13 inch baking pan with parchment paper. Whisk together flour, baking soda, salt and coffee powder. Set aside. In the bowl of an electric mixer, cream together the butter and sugars until creamy and well combined. Add the eggs, vanilla and coffee liqueur, beating well after each addition. Add the melted chocolate and beat to combine. Stir the flour mixture into the wet ingredients, stirring only until just combined. Stir in the chocolate chips. Spread dough into prepared pan. Dough will be thick and may be hard to spread. The best way to spread it evenly is to wet your hands and use your hands to flatten the dough. Sprinkle reserved chocolate chips over dough. Bake at 375 for 40 minutes, or until set. Allow to cool completely. For optional white chocolate drizzle: Spoon melted white chocolate into a ziplock bag. Cut a tiny hole in the corner and pipe the chocolate over the cooled bar before cutting. Cut bars into squares, kiss your diet goodbye, and enjoy! 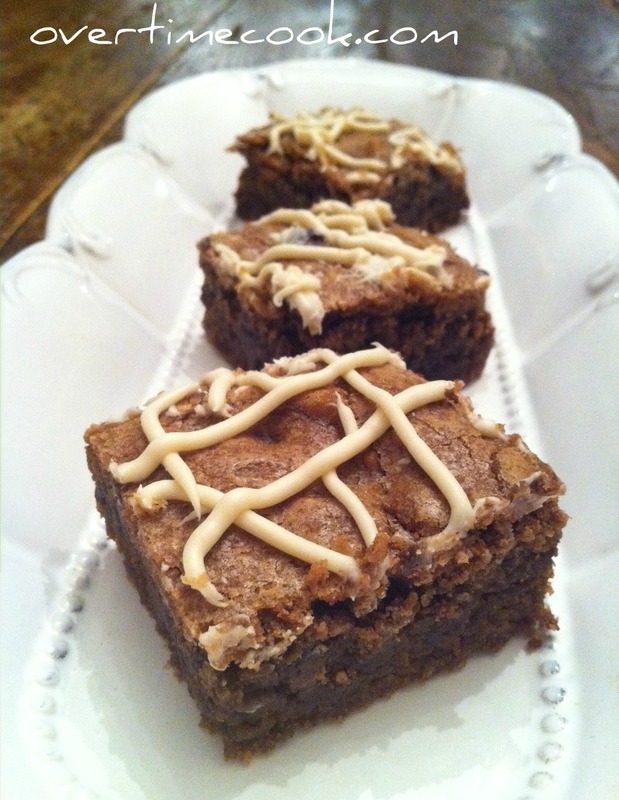 They look chewy and delicious and the coffee in them…perfect! mine were dry, what did i do wrong?? I’m sorry to hear they came out dry. Did you bake them too long? Did you leave out any of the ingredients? If you email me overtimecook at gmail I can try to help you figure out the problem. These are heaven!!! Just baked these last night and already almost half the pan is gone! Can I use chocolate liquor instead of coffee? These look delish!!! Can I sub the butter/ margarine for oil instead? Good question. Did anyone ever try to sub oil instead of margarine for this? and how did it come out? I swapped the margarine w coconut oil and it was awesome!! Equal sub. I don’t have coffee liquor should i leave out or replace with something else? Replace it with either chocolate liquor or more coffee. If I don’t have it, how can I go about using instant coffee granules? Don’t you need to liquefy it with hot water before adding it in to the mixture? The brownies were great, though I’d skip the salt next time around and maybe up the coffee a bit for stronger flavor. Thanks for all these fabulous recipes. A friend recently led me to your site and I’ve been enjoying ever since.